If you or your son matches this description, please don't hesitate to contact us. We'll find a suitable time to practice at church. 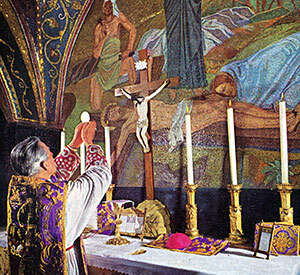 It takes effort to learn to serve the Traditional Liturgy, but it is very rewarding. The Regina Angelorum Choir sings at the first Saturday Mass in Calumet City and the Mater Dei Choir usually sings at the Saturday evening Mass in Munster. We hope to offer opportunities for learning Gregorian chant and singing polyphony. For now, please contact us so we know you're interested. The Northwest Indiana Latin Mass Community may be able to sponsor nearby priests and seminarians for training in how to celebrate the Extraordinary Form of the Roman rite in any or all its forms (i.e., Low Mass, Sung Mass, Solemn Mass). Various local and non-local opportunities and locations exist. Training DVD's are also available in addition to or as a substitute for personal instruction. Training opportunities also exist for permanent deacons in the role of deacon or sub-deacon for Solemn Mass. All inquiries are welcome and handled discreetly. The Latin Mass Community may be able to provide advice, equipment, publicity, altar servers, and financial assistance to priests interested in offering the Traditional Latin Mass in their own parishes or oratories. Training for altar servers is also freely available. All inquiries are welcome and handled discreetly.